Time for part-three of my five-part series on marriage in the Georgian to Regency Eras. Today I shall move on to the wedding ceremony participants and the preparations to be beforehand hand. Here we go! 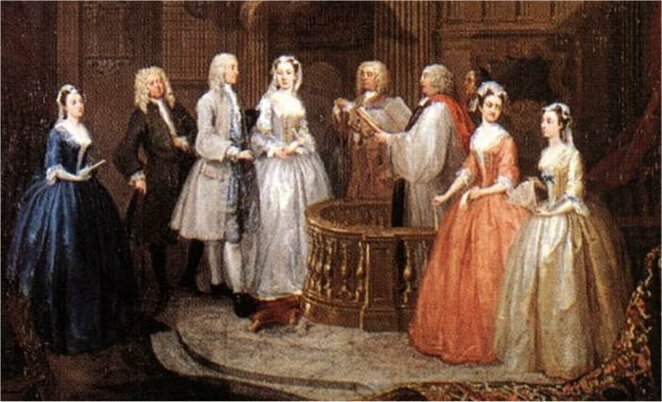 William Hogarth painting of a 1729 wedding. To understand wedding preparation during the Regency, you must start by erasing everything you envision as part of a modern-day wedding. 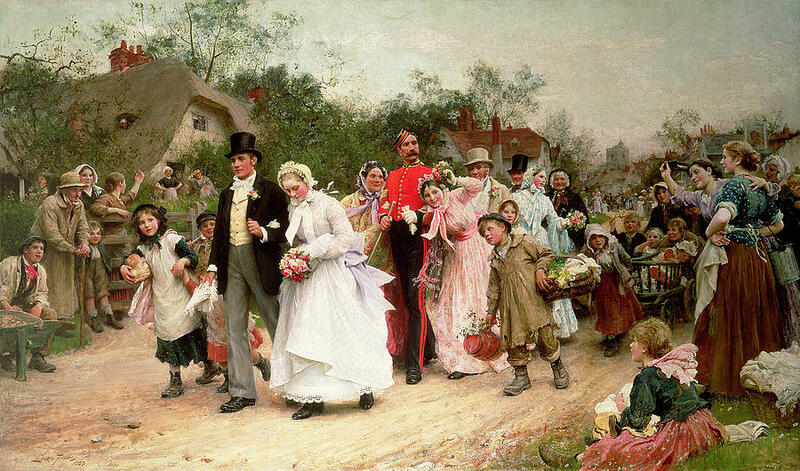 English weddings prior to the Victorian Era were small, understated events. The primary purpose of the ceremony was the religious solidification of the marriage contract. For the most part, everything was approached with this serious aspect foremost. The simplicity factor was one reason why the time between proposal to marriage could be very short. For most couples, the two weeks waiting for the three readings of the Banns was plenty of time. A longer courtship period would likely be the result of concerns such as ensuring a house to live in, financial security, and similar practicalities rather than needing time to plan the ceremony itself. Unless a special license was procured, or one was of a faith other than the Anglican Church, the wedding procedure was fairly standard. Those couples of extreme wealth and importance might have a glitzier arrangement and grander celebration, but never the ostentatious affairs we have today. Location and Timing of the Wedding— A wedding could take place on any day of the week. All weddings took place in the parish chapel where at least one of the two persons lived. Per Hardwicke’s Marriage Act of 1753, weddings occurred during canonical hours of eight AM to noon. Since most members of the ton could claim London as their residence, and lived in the fashionable districts such as Mayfair, Grosvenor, and St. James, many Regency weddings took place at Saint George’s Church in Hanover Square. From 1725 when St. George’s was established, thousands of weddings were conducted there. In 1816 alone there were 1063 weddings! Decorations— Flowers have always been an integral part of any special ceremony. Weddings are no exception. Brides commonly held flower bouquets, perhaps of a simpler variety then we see today, but tied with ribbons and/or lace. Decorating of the church itself was unlikely. Again, the ceremony was solemn and churches were sacred places of worship. Wedding Guests— It was unusual for anyone outside the immediate family and closest friends to attend the ceremony. If family members lived further away they would be invited, and time may be allowed for travel, but no one would think badly if they chose not to come. The only requirements were the clergyman, parish clerk to ensure formal logging in the register, and two witnesses. Local citizens often waited outside the church, ready to cheer and congratulate the newlyweds. It was common for these folks to form a processional behind the couple, shouting well-wishes all the way back to their house. The painting above, from 1883, is an excellent example. Note that the cluster of people following the bride and groom is small compared to the number watching from the sidelines. 1890 wedding invitation. Click for larger view. Invitations— If sent at all, invitations were handwritten by the bride. Depending on her creativity, the invitation may be fancy, but more often it was a basic letter giving the facts. Bride’s Attendants— A bride was typically assisted by one or two female attendants. The number tended to increase if the bride was of higher society. These women helped the bride in various ways – penning invitations, getting dressed – and one was designated the official witness for the parish registry. She could be married or unmarried. The term “bridesmaid” or more commonly “bridemaid” without the S, was in use since the 1500s. “Maid of Honor” was akin to “lady in waiting” so more specifically referred to royal attendants. The use of “maid of honor” in relation to a bridal attendant was a late 19th century, American addition. The term “matron of honor” to specify a married attendant is an Americanism not seen until after 1900. Flower girls— surprisingly, are an ancient tradition dating back to Rome. Very popular during Medieval and Elizabethan times, having a young girl dressed in white (for purity) preceding the bride to scatter petals, sweet herbs, and seeds (for fertility) was essential. The practice waned during the sedate wedding proceedings of the Georgian Era, although it was not unheard of. By the Victorian period the flower girl again became important, and remains so to this day. Groom’s Attendants— Same as with the bride, the groom enlisted close friends to lend a hand. With the ceremony being a quiet event and no such thing as a bachelor party or extensive reception to give a speech at, their duties were minimal. One man was designated as the “best man” to stand with the groom and serve as an official witness. Historically the groomsmen were “blade knights” who served as protectors of the bride and guards for the couple during their vulnerable hours preceding and following the ceremony. This wasn’t as necessary by the civilized Regency! 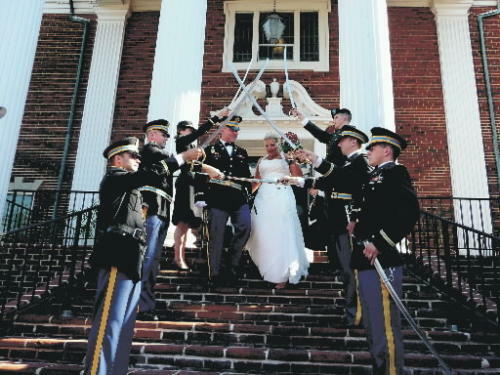 We see this same tradition today in military weddings where a sword wielding “honor guard” form the saber arch for the couple to walk through. Engagement rings weren’t customary and there were no double ring ceremonies. The Bishop complained about couples kissing at the altar. They could do so in the other room where they signed the parish wedding register. Royalty seemed to marry at night. Princess Charlotte was married at Carlton House at 9:30 PM . Every one except Quakers and Jews had to be married in the Parish church by a clergyman in holy orders of the Church o England. Only Quakers and Jews were exempt from this. Catholics, Baptists, Presbyterians, Methodists, Unitarians all had to be married in the parish church by a clergyman ordained by the Church of England unless they ahd a special license and then they just needed the Anglican clergyman. Thanks Sharon I really enjoyed this latest passage about Regency marriage. It is wonderful to learn how all of the modern day traditions were born and equally amazing to see how much they have changed or been modified over time. So interesting the way things change over time. I also found it fascinating that by 1890 (the date of that invite) they were already writing out the invitations as we still do for the most part. Jay and I did not get married in a church (we actually got married in the University of Oklahoma football stadium…looonngg story LOL), but it was pretty small and I sent out handwritten notes as invites that looked a lot like that one. Very cool! I wanna hear the looonnngggg story!!!!!! Yes, I too noticed the similarity in the formal wording of the invitation. Funny how some of those traditions remain. Usually we have no idea why! The condensed version: When Jay and I started talking about WHERE we were going to get married, we consulted our families. My family is very religious (my father is a minister) and insisted that we get married in church but my in-laws didn’t want to do that. They thought that the perfect solution was to get married in a backyard BBQ setting and I didn’t want to do that in August (it was 110 the day I got married). The closer we got to needing to make a decision, the farther away we were from a consensus. I was getting very stressed and starting to insist we just elope and call it a day. Jay worked for the University of Oklahoma athletic department at the time. He was telling some of the people he worked with that we were having difficulty deciding on a location. We were then offered the opportunity to get married in one of the large “lounges” of the Stadium. This worked because they would let us use it for free (Score!! ), we could have a “traditional” ceremony with my dad marrying us, but my in-laws would not have to go to church. The end result was a small wedding followed by a picnic-type reception in a large glass walled room overlooking Owen Field. The funniest part was telling people to park in the stadium and take the elevator up to the Club level. I’ve never seen people so giddy to attend a wedding. I have pictures, but the photographer wasn’t focusing on the field much. LOL This is the short version because the long version involves disagreements and new ideas and discarded ideas and lots of tears and threats (from me) to just skip it all and then the drama of figuring out how to get married at OU and NOT make it an OU themed wedding. Note: I was glad it all worked out like it did though because my FIL was a very involved OU alum and he was THRILLED that we got married in the stadium. He died 2 months after our wedding. Everyone was satisfied and I have a funny story. Love it!! What a dilemma you two faced, and what a fun, unique resolution. I am glad you can focus on the humor of the situation and put aside the difficulties, Stephanie. I am sure it must have been harsh at times. But, love conquers all, as they say, and when two people vow to cherish forever, God will honor. Am enjoying all the info on Regency weddings!!!! I have a question on Elizabeth and William…..in “My Dearest Mr. Darcy” when they are being remarried and William gives Elizabeth her new ring, it mentioned his mother’s engagement ring of sapphires and diamonds. Then goes on to explain the wedding band he designed for their first ceremony and the wedding band he designed for the second ceremony! Where did the DESIRE band come from in “Season of Courtship”??? He gave her his mother’s ring the day after his proposal according to “My Dearest Mr. Darcy”. Keep up the great writing!!!!! Blessings for a great week!!!! Your example of the ring discrepancy perfectly shows how difficult it is for a writer when tackling a long series. This is especially true when “going back in time” as it were. Like I discovered when writing of Dr. Darcy’s life, comments made rather offhand about past events can become a trial to work around and/or fit in when later writing of that time period in detail. In the case of the comments about the engagement rings in My Dearest Mr. Darcy, when writing A Season of Courtship and really thinking about it, I realized it was unlikely Darcy had his mother’s engagement ring burning a hole in his pocket when the whole second proposal was unplanned! LOL! After Lizzy said yes, I reasoned, he would then send to Pemberley for his mother’s ring, which would have sat in a drawer for years so presumably would need to be polished, checked by a jeweler, and perhaps resized. This would take time. For the sake of adding an interesting extra bit to the prequel duo, this worked nicely! I can drag out the drama, so to speak. 😉 Hence the temporary engagement ring given to Lizzy in Meryton. As for the DEAREST ring: When doing a bit of research into jewels and ring designs for the scene in Meryton, I stumbled across the Acrostic Ring fad. I had never heard of it! Immediately I saw the potential to take the first engagement ring offering to a new level. Cool, huh? The other engagement ring will come into play in the next book. As for the DEAREST ring: It is forever one of Lizzy’s favorites, and will undoubtedly be mentioned in future Saga novels— now that I know it exists. LOL! You have a blessed week too!! Thank you for your quick response!! I know you are busy on Book 2 of prequel!! When I read Mr Darcy My Dearest, I remember thinking why he had his mother’s ring so handy??!! I also thought it would need to come from a safe or some such thing, and would most certainly need to be cleaned, fixed, etc because of Darcy’s attention to detail!! I look forward to the presentation in further books!! Keep up the great writing!! Blessings for a great week!!! Very interesting. I had a very small simple wedding with only family and close friends. So far I found the series very informative. Thank you. Also, come to think of it, all my invitations were hand written.